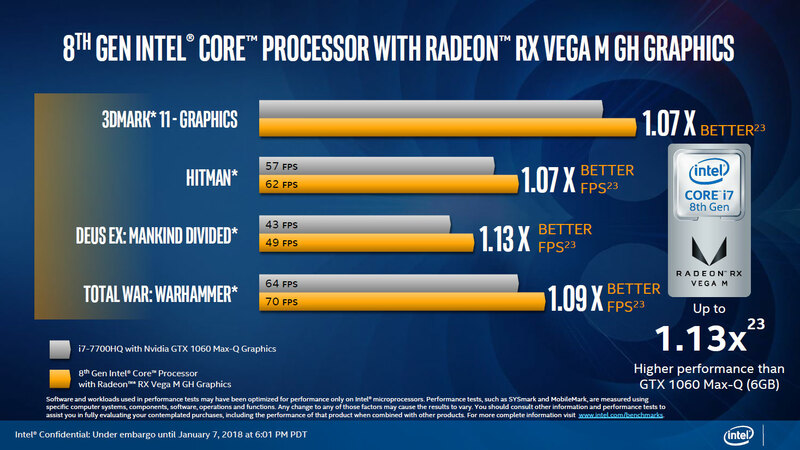 Last year, Intel announced that it would be bringing a custom AMD Radeon RX Vega graphics solution onto its processor package, and today marks the official launch of the new 8th Gen Intel Core CPUs with RX Vega M graphics, with G-series branding. 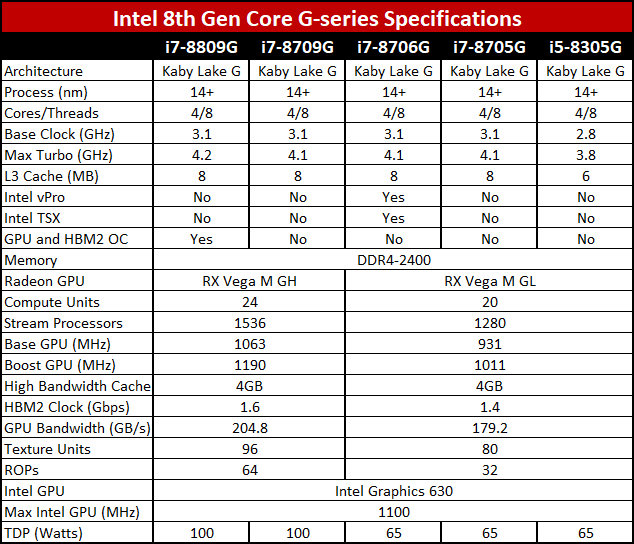 In effect, these are quad-core Kaby Lake processors (H-series mobile parts), only with a separate Vega GPU and HBM2 memory. These are currently mobile solutions, and while they will also appear in all-in-one devices or compact systems like Intel’s upcoming 8th Gen NUC8i7HVK and NUC8i7HNK, we don’t expect to see full desktop implementations. There are some immediate eye openers in the specs. The Core i5 will have Hyper-Threading enabled for the first time, so the only difference between the i5 and i7 parts will be clockspeeds and the amount of L3 cache. We haven’t received pricing information yet, and these will ultimately be sold in packaged solutions, but the Core i5 should be nearly as fast (other than the GPU) for perhaps $100-$200 lower pricing. While I’m on the subject of TDP, it’s important to note that this is total power for both the CPU and GPU aspects of the chips, and Intel has worked to make better use of the available power. Through its dynamic power sharing technology, Intel says the G-series processors can run games at the same framerate with up to 18 percent higher efficiency—basically, the chip can run at 45W with dynamic tuning on with the same fps as 62.5W with dynamic tuning off. 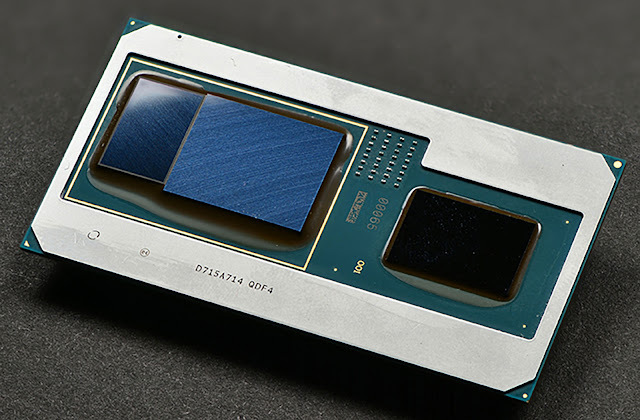 The Radeon GPUs in these chips will be fully supported through Intel, though it will receive driver updates through AMD. Basically, you’ll see a skinned version of the Radeon Settings application, with Intel blue accents and slightly tweaked branding, but you’ll still have full access to all the extra features like Radeon Chill, Radeon ReLive, WattMan, and FreeSync—though you need to use the Radeon video outputs for FreeSync, obviously. Also note that the Intel HD Graphics is fully enabled and present in all the processors, which means you can also do things like VP9 and HEVC 10b encode/decode and Quick Sync. 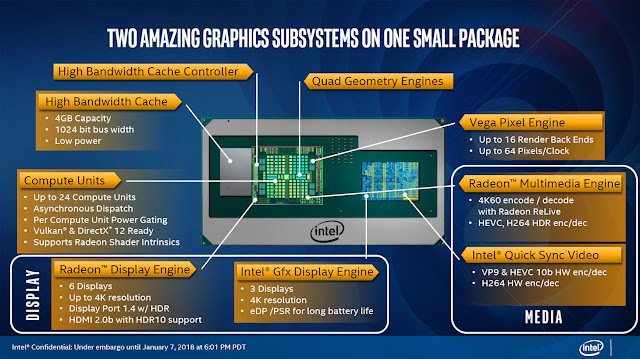 The chips will also support up to nine video outputs—six from the Vega chip and three more from the Intel GPU. 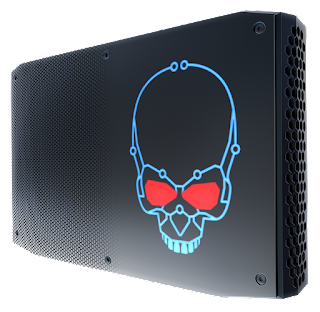 Intel’s upcoming NUC as an example will feature six video outputs, two each for Thunderbolt 3, DisplayPort, and HDMI. What should we expect in terms of performance? Intel provided a couple of reference points, though as usual we need to take these with a grain of salt as we haven’t run any benchmarks. 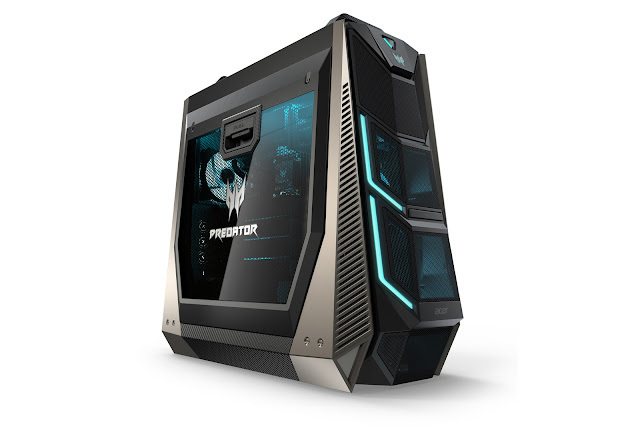 Compared to a three-year-old i7-4720HQ with GTX 960M, Intel shows graphics performance that’s 2.0-2.7 times faster. More importantly, Intel also shows slightly faster (1.07-1.13X) performance than a current generation GTX 1060 Max-Q 6GB laptop. That’s using the faster Vega GH variant in both cases, and there will almost certainly be games that favor Nvidia’s GTX 1060, but overall the new processors should be quite capable. Intel also claims up to 9.3 hours of battery life (with a 60Wh battery). Intel hasn’t revealed the full pricing details on the parts, and laptops and the new NUCs aren’t expected to ship until the March-April timeframe, so we’re still a few months out from having hardware to test. There are several OEMs with hardware announcements involving the G-series processors that we’ll cover in the next few days, and we’ll have further details then. It’s a brave new world for Intel’s processors and Radeon graphics. Discrete desktop solutions will continue to have far more flexibility in terms of graphics card upgrades and performance, but for mobile solutions this should allow for even smaller and thinner gaming laptops. We’re told to expect 17mm thick gaming notebooks using the new processors, which isn’t all that different from some of the existing Max-Q designs, and we’ll have to judge the laptops on their own merits and not just on one aspect of the hardware. We look forward to seeing the new designs in the coming months.